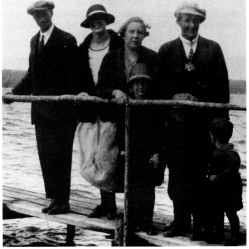 Martin married Anne Hjelmeland in 1920 and they were blessed with three children - Irene, Lloyd and Donald. Martin passed away April 28, 1933, and is buried in Danvers Cemetery. Donald, born 1947, married Karen Smith. They have two sons; James, born 1968, and David, born 1974.
two children: Amanda, born 1973 and Adam, born 1979. David was born 1952. Patricia was born 1955. Lloyd was born in 1923. He attended school in Erickson. He served in the Armed Forces in World War II and later worked in the mines. In 1965 he came home and bought N.W. 18-17-18W where he now resides. Donald was born in 1925. He attended school in Erickson. He served in the Armed Forces in World War II. He married Marion Magill and they reside in Win­ nipeg. In 1934, Anna married Neil Mcinnes. Left to Right: John and Sophie Hofdahl, Anna, Martin, Irene, Lloyd and Donald Bergeson. Yesterday is a cancelled cheque. Tomorrow is a prom­ issory note. Today is the only cash we have to spend. Nils, was born in Sweden and immigrated in Canada in 1914. He enlisted in the First World War, serving in the 183 Battalion in England and France. Upon return, Nils married Emma Sjogren, settling in the Onanole area until 1935, when they moved to Erickson. In 1943, the family moved to Brandon. Nils passed away at 82 years and is buried in the Veterans section of the Brandon Cemetery. Emma resides in a Nursing Home in British Columbia. There were four children. Gladys, born June 25, 1913, married George Custer on December 31, 1941, in British Columbia. George was born in April, 1896, and passed away September 9, 1962. Gladys resides in B.C. Harry, born February 22, 1916, at Minnedosa, at­ tended Whirlpool School and later played hockey with the Brandon Wheat Kings. He worked for several far­ mers in the area and also the Relief Camp at Clear Lake until moving to British Columbia where he found em­ ployment. In 1940, Harry married Ellen Halverson, formerly of Erickson. In 1942-1946 he served in the Second World War. Harry and Ellen had four children and are enjoying their retirement in B.C. Lilley, born December 22, 1923, attended school at Onanole. She married Bob A vison and they reside at Enderby, B.C. Their five children are, Robert, Mark, Sharon, Carol and Grant. Russell, born September 17, 1928, at Onanole, at­ tended school at Erickson. He married Patricia Campbell of Esterhazy, Saskatchewan. They own a farm at Tantallon, Saskatchewan. Russell works in the Esterhazy Potash Mine. Their six children are, Penny, Patty, Rease, Kevin, Lonnie, and Darlene. 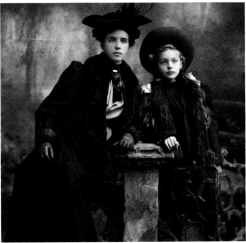 Selma Wickdahl (Bergquist) and Lydia Wickdahl (Goodman).